Earlier this month, PJ and I spent a few days in New York City before the spring semester began. 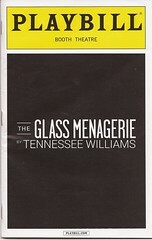 We saw four shows in three days, the of which was Tennessee Williams’s The Glass Menagerie starring Cherry Jones, Zachary Quinto, Celia Keenan-Bolger, and Brian J. Smith and directed by John Tiffany. As PJ and I discussed after seeing it, The Glass Menagerie is a play we each had to read in high school, and neither of us came into this production thinking that this is one of Williams’s best works. This production made us both rethink that position. It is an excellent production, one of the best plays I’ve ever seen on Broadway! The play is about a woman, who was abandoned by her husband, and her two adult children. Cherry Jones plays the woman, Amanda, whose only goal in life is to see her daughter, Laura, played by Keenan-Bolger, married. Amanda knows that Laura’s only hope for future security is marriage, because she is extremely shy and partially crippled. Amanda enlists her son, Tom, played by Quinto, to arrange for a Gentleman Caller to court Laura. The last act of the play depicts what happens when the Gentleman Caller, played by Smith, arrives. Everything about this production is captivating. The stage design, the use of only minimal props, the staging, the acting, everything grips the audience in these characters’ story. Cherry Jones is a Broadway legend, and I can now see why. Amanda could easily become a caricature, but Jones humanizes Amanda and, even though we can see how she’s doing almost everything wrong, we also see that she’s ultimately right. I wasn’t expecting much from Zachary Quinto to be honest. I dismissed him as a TV and movie actor. But he was excellent as the son who longs to escape from his suffocating mother, a stand-in for Williams himself. And Keenan-Bolger is heart-breaking as Laura. I wouldn’t be surprised of all three received Tony nominations this year and would definitely support all three winning. There’s only a little time left to see this production. I highly recommend it. It’s right up there with The Little Dog Laughed and August: Osage County as one of my favorite Broadway shows I’ve seen. This is everything a night at the theater should be.